We are a technological world – SmartPhones, Tablets, eReaders – any number of gadgets that we constantly utilize to stay connected or just for fun. Most of us will spend hours staring at a screen, muttering “Hold on a sec, I just need to do one more thing…” when someone is hovering waiting for our attention. Mother’s Day is Sunday, and it’s important to make sure we spend quality time with our Moms and our kids to show them how much they mean to us and how much they are loved. Everywhere you look you see parents and children glued to their electronics and completely disconnected with one another. I joke that our ‘family time’ is spent with each of us in front of our own individual screens – sure, we’re all in the same room, but we’re not necessarily interacting with each other as we’re lost in our own little worlds. It’s only one day, I’m sure we can survive being unplugged for a day – especially since this will be by choice rather than instigated by Mother Nature and a power outage. And if I’m being honest, it would be the perfect Mother’s Day gift to not have Princess Nagger babbling on and on and on and on about Minecraft. Ahem. I personally think the #SocialBlackout movement is genius – I also think mothers should be celebrated more than just one day a year (you know, because we’re awesome), by the same virtue I think unplugging more often than one day would be a good idea, too. Disconnect to reconnect – that has a nice ring to it, doesn’t it? 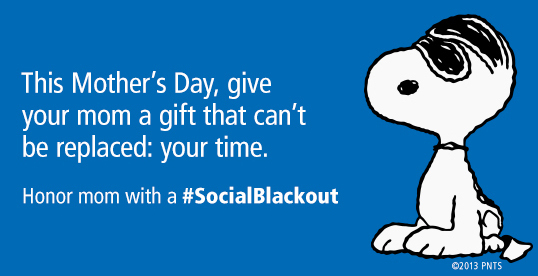 Join the Mother’s Day movement every mom will be proud of: #SocialBlackout. It’s simple. In fact, it may be the easiest event you’ve ever attended. Just don’t show up. Because mom has always been so attentive with us, we’re honoring her on Sunday, May 12 by turning our attention to her instead of our friends and feeds. 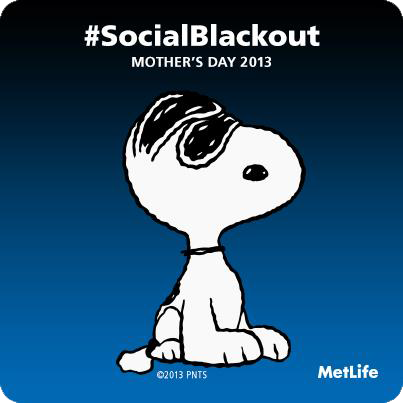 Just set your profile pic with the official #SocialBlackout image, update your status with a warm Mother’s Day wish and say “arrivederci” to your social sites for a day. Note: I participated in a campaign on behalf of Mom Central Consulting for MetLife. I received a promotional item as a thank you for participating. As usual, all opinions are my own and not influenced by outside sources. See my disclosure policy here. This entry was posted in Alert, Announcement and tagged Alert, Announcement, family time, gadgets, metlife, moms, Mother's Day, quality time, technological world, unplugged by Stacy (the Random Cool Chick). Bookmark the permalink. Sounds like a great plan. Let’s see if my family can/will do it. . . Awesome! I think you’re right, this will be the best gift ever to receive from my children. Time. We have to admit that technology makes a captive of each of us, of our own little worlds. One day of being away from these will be one memory to cherish a lifetime.